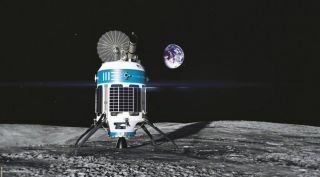 Moon Express is among the Google Lunar X Prize team continuing its lunar mission efforts, as part of broader business plans, despite the end of the competition. SAN MATEO, Calif. — The finalists in the Google Lunar X Prize competition say they will continue efforts to send spacecraft to the moondespite the expiration of the prize in March. The X Prize Foundation announced Jan. 23 that the competition, which offered $30 million in prizes for private teams able to land on the moon and achieve milestones there, will expire at the end of March after prize sponsor Google decided not to extend the competition deadline again. "Disappointment is certainly there," said Naveen Jain, chairman of Moon Express, the U.S. company that was one of the finalists. Speaking via webcast at the Space Tech Summit here Jan. 24, he said it might be possible for another company to step forward and take over sponsorship of the prize, an option the X Prize Foundation said it was considering. Jain, like others at the company, emphasized that the prize was not a major part of the company's business plan. "From our perspective, it doesn't really matter that much, because we started Moon Express fundamentally because it's a good business, and that does not change." Moon Express will continue development of its MX series of lunar landers, he said, but with relaxed schedules given the lack of a prize deadline. "Our hope is that we'll still be able to land on the moon this year," he said. "And if it goes to next year, so be it. We're so close to making it happen." TeamIndus, the India-based team in the competition, expressed similar sentiments. "We just completed seven years of trying to chase this prize," said Rahul Narayan, founder of TeamIndus, in a Jan. 24 interview. "It is, from that perspective, a bit of a letdown. We thought we came close." He said TeamIndus and other competitors made a last-ditch effort to convince the X Prize Foundation and Google to extend the deadline. "We held out an expectation or a hope that, if we all got together and had a chat with them, maybe there is a possibility, but that has not worked out," he said. TeamIndus announced Jan. 24 that it had agreed with Antrix, the commercial arm of the Indian space agency ISRO, to cancel the launch contract for a Polar Satellite Launch Vehicle launch of the TeamIndus mission. Narayan said the termination of the contract was amicable, and that the team would consider Antrix for future missions. The team plans to continue development of its lunar lander and rover despite the end of the competition, taking a long-term view about interest in lunar exploration. "We believe there is growing interest in doing science and delivering payloads to the moon. As an aerospace startup, we see ourselves being part of that industry," he said. "Over the next three to five years, we're looking to launch to the moon multiple times." TeamIndus won't make major changes to the design of its lander or rover, he said, calling the engineering work on the spacecraft 80 to 85 percent complete. There may be some smaller modifications, he said, such as adding more payloads to the rover and reducing its range, since there will no longer be the prize requirement to travel at least 500 meters after landing. The team's existing partnerships for flying payloads and experiments will continue, Narayan said. That includes an agreement with another finalist, Team Hakuto of Japan, to fly its rover on the TeamIndus lander. Team Hakuto is a project of Japanese startup ispace, which raised $90 million in December for its own series of lunar missions that it planned to pursue independent of the Google Lunar X Prize. SpaceIL, the Israel-based team in the competition, also expects to continue its lander outside of the competition. The company announced a fundraising effort last month to raise $30 million to complete work on the spacecraft and launch it, but has not provided an update on the progress of that effort, which previously had a deadline of late December. "SpaceIL is committed to landing the first Israeli spacecraft on the moon, regardless of the terms or status of the Lunar X Prize. We are at the height of our efforts to raise the funds for this project and to prepare for launch," spokesman Ryan Greiss said in a Jan. 24 statement. The team, he said, will provide more details about its plans once it secured its funding. In a December interview, SpaceIL Chief Executive Eran Privman said that the team was hoping for another extension of the prize to give it enough time to complete the fundraising and finish assembly of the lander, but would continue at its own pace if that extension did not materialize. "At the end of the day, our main target is not only the competition, but putting a spacecraft on the moon," he said. "If we feel we are not mature enough to meet the deadline, we would be in favor of doing a proper mission rather than stick to the date of the competition." Synergy Moon, the last finalist in the competition, is an international team that had provided few updates about the development of its lander, which would fly on an Interorbital Systems' Neptune rocket that has yet to make a first launch. "Synergy Moon is still sending a mission to the moon this year, and will release more information about that next week," team leader Kevin Myrick said in a Jan. 24 email. A statement from Synergy Moon said the team, which also partnered with a number of other smaller Google Lunar X Prize teams that failed to qualify as finalists last year, planned a new effort called "Being in Synergy" that would build upon the X Prize effort. "Its aim is to bring awareness and access to private space exploration, travel, technology and education to a broader audience," it said in a statement.